With this guide you will learn how to start an African Violet plant from a leaf. Snap off a large leaf from the African Violet plant. With your finger, poke a hole in the soil. Insert your leaf stem in the soil. The bottom of the leaf should be touching the soil. Water your leaf just like you would an adult African Violet plant. The soil likes to be kept damp, like a sponge. Never soggy or dry. A baby African Violet is born! After two to three months, your leaf will sprout a new baby African Violet. Sometimes you will notice that your original leaf will die. (See above image) If this happens, you can remove this leaf. If it does not die, just leave it alone. 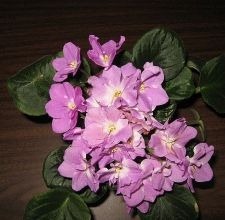 In a little while, your African Violet will have it’s very first flower. You can also mix leaves from different color African Violets and get a mixed plant. Example: Take a leaf from a white plant and a leaf from a pink plant and when they grow, you will have flowers that are part white and park pink. If can be fun to see what colors you can make. When you water your African Violet plant, do not get water on the leaves. This will leave marks on them that will not go away. If this happens, pluck off those leaves and use them to start new plants.